Steve Rice (Olympia, United States) on 27 January 2010 in Plant & Nature. 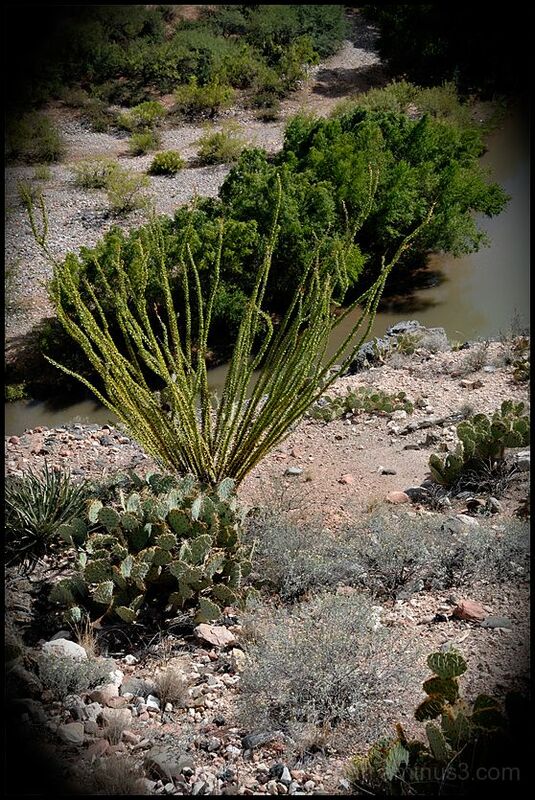 These desert plants, Ocotillo and Prickly Pear, growing above the river, remind us how desert like this area can be. The Ocotillo, the plant with the long spindly stems, is quite interesting. The stems here are covered with small green leaves. If conditions become too dry, the leaves all dry up and fall off to conserve moisture. When water becomes more plentiful, the leaves grow again. If it's spring or summer, the plant will also bloom. Love the cactus, great shot! Joli détails ! Bonne journée. Nicely presented and a very interesting shot to see. Excellent. very green for the desert! Great groundscape, nice detail. I like the angle of this look around. An interesting post for the fine picture and your explanation of how it grows and handles drought. This scenery is not what I first think of by a desert....what a varity of (smart) vegetation! des plantes grasses et la rivière qui plonge vers des abimes qui se dessinent, j'aime cet aspect vertigineux que donne la plongée vers l'eau verte. Like peeping through the window of the train to a nature that is so wild and yet so beautiful. an excellent image of these two cactii. We saw both of these when we travelled to Texas many years ago. In fact the Ocotillo were in bloom at the time; there had been a rain before or so the locals told us. This is a closeup of yesterday's plant? Very unique and well detailed here. Thank you for the info on the ocotillo. The vignetting adds a nice touch. Surprisingly, prickly pear grows here and survives. I thought it was too cold of a climate here to survive.